I went on another outing to Murder By the Book, which as you know is among my favorite places in Houston because it's not only full of books but good people. In fact, thanks to two of its good people, I'm making progress on a New Novel. Send lots of good energy my way, please. Enough about me. 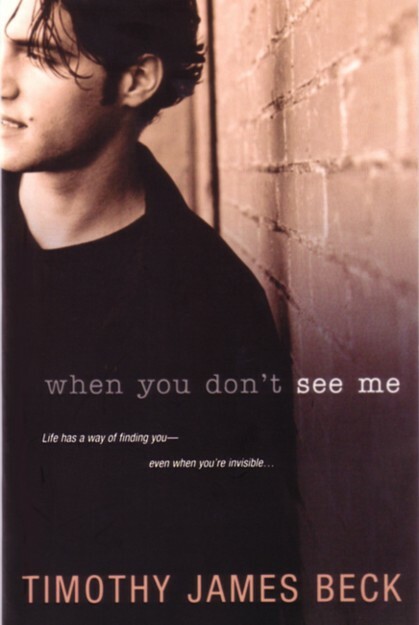 Today a writer I've featured on here before, Leann Sweeney, had a signing at Murder By the Book. 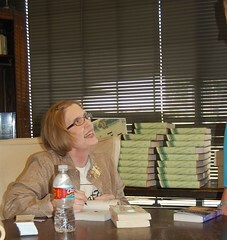 Leann is the author of the Yellow Rose mystery series featuring Houston P.I. Abby Rose. I love a good mystery set in Houston, and I've been looking forward to Leann's next book. So I was a little surprised when advance buzz informed me that this was a NEW series: A Cat's In Trouble Mystery. Was I READY for this? After all, I like Abby Rose. And I'm a dog person. Not that there's anything wrong with cat. Today, I got my questions answered. Abby Rose will probably return one day. (Yay!) For now, I get to enjoy new character Jillian Hart, quilter and cat companion who must investigate when one of her three cats--Chablis, Syrah, Merlot--falls victim to a possible catnapper in Jillian's small South Carolina town. Just as an eager reader would hope, Jillian's sleuthing uncovers more missing felines and a murder in Mercy. One of the things I've learned about Leann Sweeney is that she enjoys reality television. She likes to watch the dramas unfold and imagine what motives and schemes are going on behind reality TV's very human faces. I totally get it. I minored in sociology because I'm fascinated by human social behavior. A show like Survivor provides plenty of examples of how our best and worst traits manifest when we try to coexist with others. And after all, a writer's family can't provide ALL the material for her books--at least if she wants to keep being invited back for holidays. 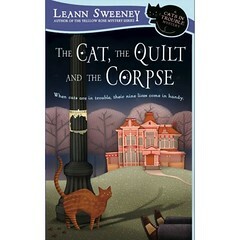 I'm really looking forward to reading The Cat, the Quilt, and the Corpse and glad to hear that Leann is already working on its follow-up. I hope Jillian--like Abby Rose before her--manages to outwit, outlast, and outplay the bad guys.